Thinning hair is surprisingly common in women. There are many potential causes, but hereditary hair loss, known as androgenetic alopecia (AGA), is the most common type. 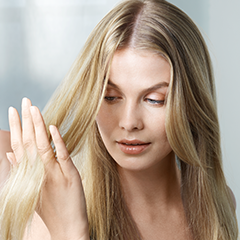 There are two types of thinning hair in women: hereditary and non-hereditary hair loss. Knowing which type you have is the first step to regrow thicker hair. Hereditary hair loss (AGA) starts with a progressive shortening of the hair’s growth cycle and a gradual shrinking of your hair follicles so they eventually no longer produce new hair and lead to a general thinning of hair. Non-hereditary temporary hair loss, telogen effluvium, happens when stress, diet, hormonal imbalance, or a traumatic event causes hair follicles to remain in a resting state, increasing shedding and temporarily thinning hair. Another type of non-hereditary hair loss is alopecia areata, an auto-immune disorder that causes defined patches or complete hair loss that may happen rapidly. If you experience this type of thinning hair, consult your doctor. For women with thinning hair, Women’s ROGAINE® hair regrowth products are FDA-approved and clinically proven to regrow hair by reviving your follicles so you can grow thicker, fuller, more beautiful hair. Did you know more than 1 out of 4 women will experience hair loss at one time or another? Here are more facts you need to know about hair loss. AGA changes your hair follicles due to genetics, hormones, and age, causing them to shrink and become inactive. While lifestyle can impact hair thickness, over 90% of all hair loss is due to genetic factors. You can inherit the thinning hair gene from either your mother or father (or both). The number of women with hereditary hair loss increases with age; it can start as early as your 20s, and is more common in the 30s and 40s. Hereditary hair loss is the leading cause of thinning hair in women, and hair will continue to thin if left untreated. Genetic hair loss can be treated with Women’s ROGAINE hair regrowth products, which revive hair follicles so you can regrow hair. Regrow your hair with ROGAINE® featuring minoxidil, the active ingredient that helps reactivate hair follicles to regrow thicker, fuller hair. It’s the #1 dermatologist recommended brand for thinning hair. Start regrowing your hair today with ROGAINE®. No topical hair growth treatment works faster to regrow fuller, thicker hair. Plus, your Satisfaction is Guaranteed*. *After 120 days of daily use.